By default native functions are replaced with modernAlert functions but this can be turned off in the constructor. Download the script from https://github.com/5um17/modernAlert and follow the readme.md instructions to use it in your project. that's amazing. Thank You so much. No! 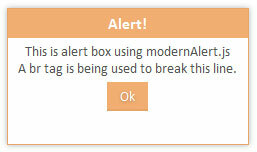 That is the limitation with every custom alert box. This can be done only using native confirm box. However, you can call the whole function in which you want to use confirm and get the return value as that function argument. I can see it is not working in IE. I will try to fix this in next release. Thanks! Please allow me some time I will fix it ASAP. can you make the alertbox vertically scrollable? Please send the request/issue here https://github.com/5um17/modernAlert/issues with the all details you have! I changed this line and it worked for me. is not working can you fix this issue ASAP ? Thank you! Sorry but I do not understand what is the issue exactly. Can you please open an issue here https://github.com/5um17/modernAlert/issues with steps to reproduce? Is IE 11 issue resolved?